There's only one reason I'd be up this early on a weekend. Well, probably more than one reason but it translates to the one biggie, "Someone I love wants to do something and I want in on it." So I have to get dried and dressed and dog walked and get into the city to see this guy. Hopefully he'll be having a better day than he was when this picture was taken. Hope you're having a holidayriffic day! Oh man, I wish that was a picture of you. that's awesome!!! I wish it was me, too. 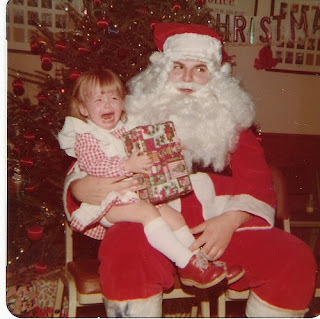 I have only one picture of me seeing Santa when I was a kid and I can't lay my hands on it right this second.